BRAVO, director Martin Scorsese and co-producer Johnny Depp, for this charming film in which Hugo, after his clock-maker father dies, lives in the attic above the concourse of a Paris railway station where he maintains the clocks (the fee for that service being paid to his alcoholic uncle) and supports himself by petty theft of food from shops. John Logan’s adaptation of Brian Selznick’s novel “The Invention of Hugo Cabret” tells how Hugo (Asa Butterfield) finds a clockwork-powered automaton. A stall-holder who catches Hugo pilfering food confiscates his precious notebook containing his drawings. The war-veteran station security officer (Sacha Baron Cohen) has formed a strong antipathy against Hugo. The stall-holder’s daughter Isabelle (Chloe Grace Moretz) and Hugo begin an adventure to get the diary back. That story forms an affectionate, sweet, beautifully-crafted basis for a film with an important additional purpose – a homage in its latter part to Georges Méliès, the father of cinema as a story-telling medium, with re-creations of Méliès’s films. 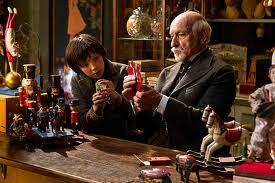 As Méliès says (Ben Kingsley plays him beautifully), the cinema is about telling dreams. In more than a century since Méliès led the way, film-makers have developed the moving image in a myriad of ways, not all of them admirable. Scorsese’s first PG film in 18 years, “Hugo” has just won a Golden Globe, thoroughly deserved.